WWDC Apple CEO Tim Cook took a few minutes of his two-hour keynote at Apple's Worldwide Developers Conference (WWDC) on Monday morning in San Francisco to stick his thumb in Android's eye. "Over 130 million customers who bought an iOS device in the past 12 months were buying their first Apple device," Cook told the 6,000 developers in his audience. "Many of these customers were switchers from Android. They had bought an Android phone – by mistake – and then had sought a better experience. And a better life," he said, eliciting laughter from the crowd. Nearly half of Apple's customers in China during the past six months, he said, switched from Android phones to the iPhone. One of the reasons that iOS has such high customer satisfaction, he said – citing a 97 per cent satisfaction rating in a survey conducted by ChangeWave Research – "is that we make available our software updates for the OS available to as many customers as possible." Almost nine out of 10 users have upgraded to the latest version of the iDevice operating system, iOS 7. 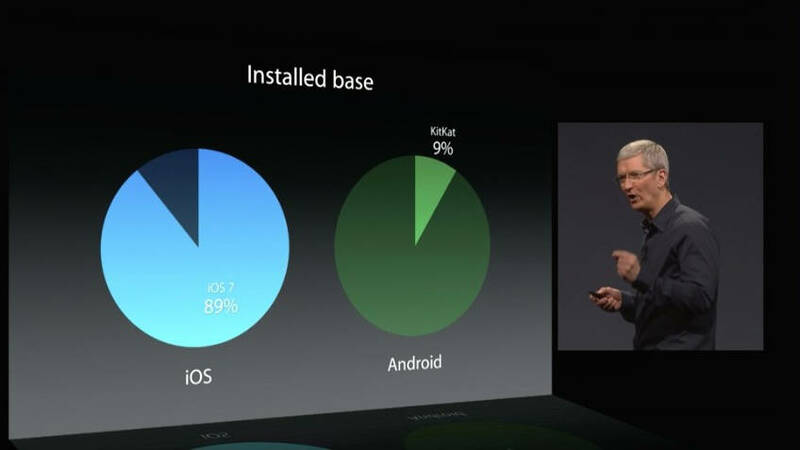 "This is in stark contrast to Android," Cook said, citing what he said were statistics that show that fewer than one out of 10 Android users are running the latest version of Android, KitKat. "And if you look at a broader group, over a third of their customers are running a version of Android from four years ago," he claimed. "That's like ancient history." Those customers don't benefit from new features, aren't able to run the latest apps, and don't get security updates, he said. "This is particularly important for Android, which dominates the mobile malware market," Cook suggested. To illustrate his point, he quoted the title of a recent article by ZDNet's Adrian Kingsley-Hughes, a self-described "big fan of Android." The article's title? 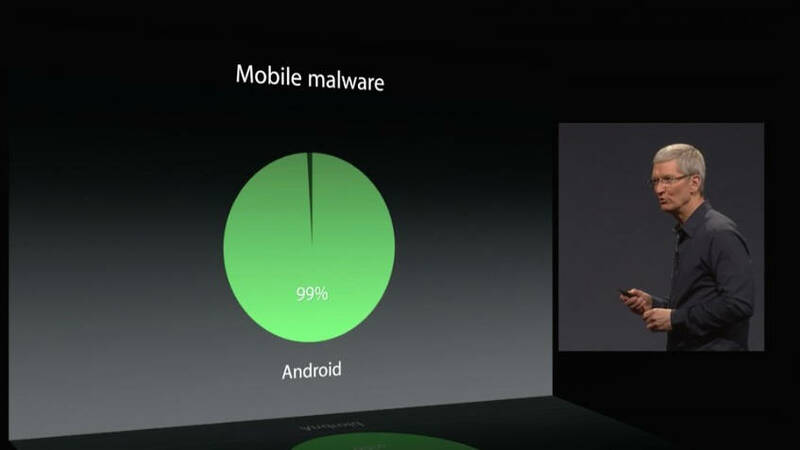 "Android fragmentation turning devices into a toxic hellstew of vulnerabilities" – and Cook's slide of that quote added animated flames to the word "hellstew."